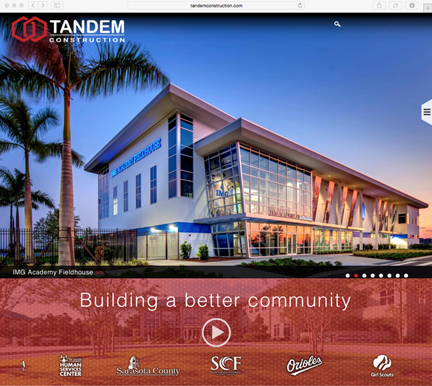 BoostDFM announces the launch of a new website for Sarasota-based construction company Tandem Construction at TandemConstruction.com. The award-winning boostDFM team was tasked with designing and developing an exciting and innovative new website to showcase Tandem's creative solutions for commercial and private construction projects. BoostDFM's experts built a responsive, fluid website on a user-friendly Drupal-based CMS platform, featuring hidden navigation, video drone fly-overs, oversized slideshow with stunning photography, and an FTP portal for subcontractor and client logins.